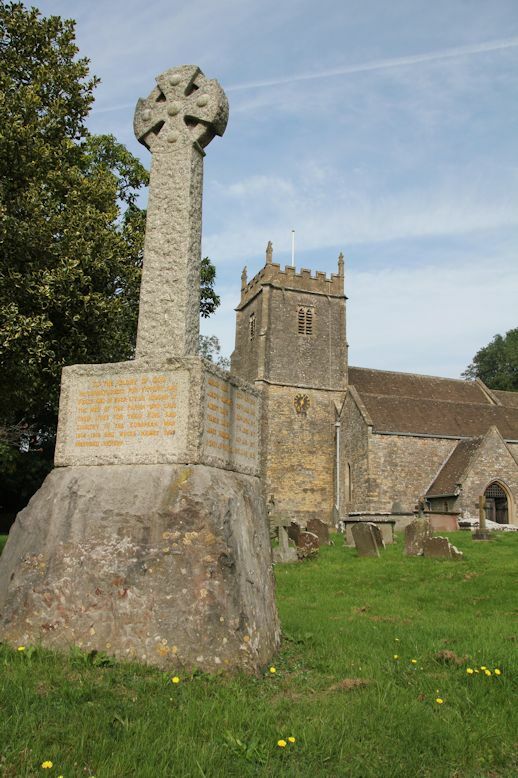 There was a large congregation of villagers and others at Tytherington on Saturday afternoon, when the war memorial erected in memory of the fallen men of the parish was dedicated by the Lord Bishop of Gloucester. The memorial which is a Cornish wheel cross of silver grey Cornish granite, with a base of the same material, is mounted on a solid block of stone from the local quarries, measuring 4ft by 4ft, embedded in concrete the whole erection stands 12 feet high. It is placed in a commanding position in the south-west corner of the churchyard, where the wall has been taken down and railings erected, thus enabling it to be seen to advantage. The inscription on the base is:- "To the glory of God in thankfulness for victory and peace, and in ever living honour of the men of this parish who gave their lives for their King and country in the European War 1914-1918 and whose names are inscribed hereon." The names on the two sides are "Gordon King, 20 May 1915; Joseph Cousins, 26 August 1916; Albert Davis, 22 April 1917; Francis Davis, 7 June 1917; James Rugman, 4 August 1917; Fred Williams, 19 January 1918; Louis Rugman, 21 March 1918; George Daniels, 26 June 1918." The whole of the work was satisfactorily carried out by Mr F. K. Howell, of the Thornbury Monumental Works. The service, which was impressive, was attended by a company of 40 local ex-Servicemen, in charge of Mr Thomas Wilson (Welsh Regiment), who paraded at the railway station, and headed by the Tytherington Church Prize Military Band, marched to the memorial where they lined up in front of those present. The relatives of the fallen men were in the enclosure round the memorial. In addition to the Bishop the following clergy were present:- The Rev Canon Cornwall (Thornbury), the Rev W. P. Kitson (the vicar of Tytherington), and the Rev W. H. Whittaker (Rockhampton). The hymn 'When I survey the wondrous cross' was sung and after prayers the Bishop dedicated the memorial. In an eloquent and impressive address from St. John xii 24 "Except a corn of wheat falls into the ground and die, it abideth alone; but if it die it bringeth forth much fruit." his lordship spoke of the sacrifice of the fallen men and the example they had set. The hymn "For all the saints" was sung and after prayers by the vicar the "Last Post" was sounded by by Mr F. Kingscott. The Blessing was pronounced by the Bishop, a verse of the National Anthem being played by the band, who also accompanied the singing of the hymns.